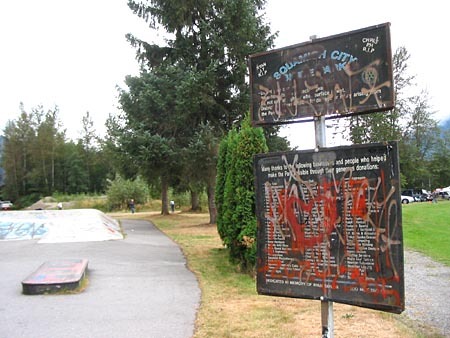 Grafittied out skatepark sign with the gas station island in the background. 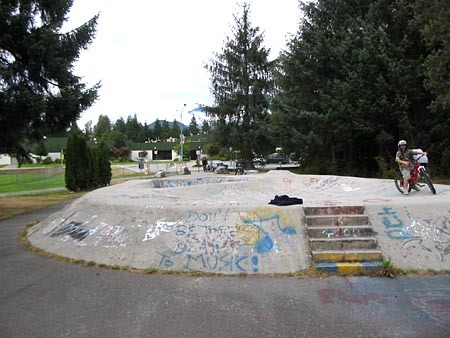 This skatepark is possibly the 2nd smallest skatepark in BC, second only to Settler's Park in PoCo which I think is just a bank and a ledge. 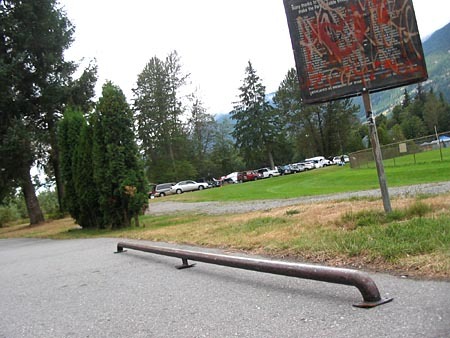 The Squamish park is an above ground bowl with some street elements next to it. The outside of the bowl is banked on all four sides which actually creates a few more lines if you don't mind being shot into the grass. 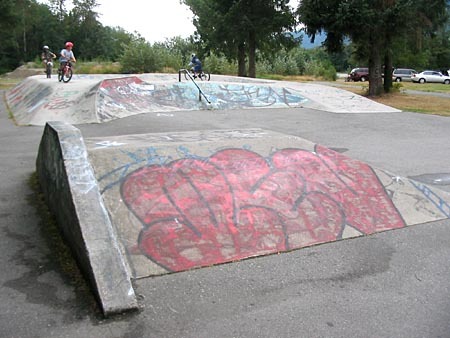 The banked part is pretty rough but if you're on a bike who cares... just blast it. The bowl is mostly shallow humps with a deeper pool corner and a tiny spine thing. 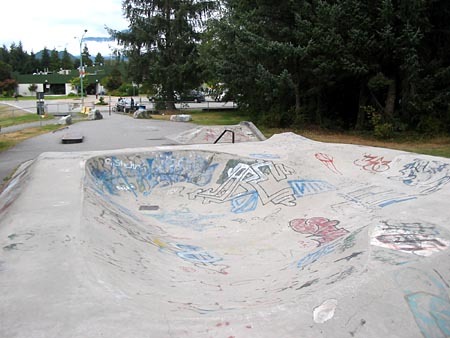 On the outside of the bowl is a shallow quarter with coping and a slanted deck. There is also a stubby rail on the bank beside the quarter. The street section just has a mellow pyramid with a curb on it and also the worlds shortest flatbar. It's about 3" tall. This is probably one of the most limited parks I have been too but still it's actually pretty fun. There is no deep bowl or scary rails, instead all of the challenge comes from trying to figure out some cool stuff to do with what's there. Driving along the Sea-To-Sky Highway towards Whistler just pass through Squamish until you see an intersection with a pedestrian bridge. You should also see signs pointing to the Rec Centre. Follow the road into the Rec Centre and park in behind the Hockey Arena. You should see the skatepark from the parking lot. The lowest flatbar of all time. An overview of the bowl section. The bowl is an above ground bowl with banks on all sides. 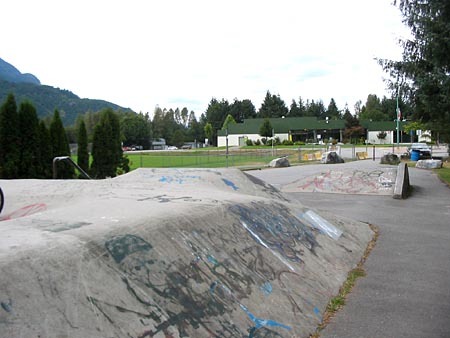 The one quarter with coping makes a bit of a hip to the outside bank of the bowl. A pyramid with a curb on it. In the background you can see the quarter and the short rail.